At the moment, I'm in the middle of counting down my favourite songs from 2004, a year when there were more boy bands than you could poke a stick at and they were generally given three singles to hit number 1 or were dropped by their record label. Why do I mention this here? Well, this week in 1989, the group that really got the ball rolling on the modern boy band era made their debut on the ARIA chart. And, had they started their career in 2004, the song that became their breakthrough hit might never been released as it followed two earlier flop singles and an almost three-year gap since the release of their very first single. Meanwhile, if you think there'd been some interesting weeks at the top of the top 50 in recent months, then this week in 1989, things were really shaken up. Bette Midler leapt from number 6 to number 1 to land her first Australian chart-topper with "Wind Beneath My Wings", dislodging The Bangles (who had jumped the same amount to number 1 the previous week). "Eternal Flame" was the only song to remain from last week's top 5, with Bette, Julian Lennon, Kate Ceberano and one of this week's new entries all blasting into the top 5. It had been a couple of years since the Queen of Soul's last big hit, 1987's duet with George Michael on "I Knew You Were Waiting (For Me)", and so what better way to launch a new album than by recording a song with one of the '80s biggest duet sluts? Unfortunately for Aretha, despite her and Elton's combined star power, as well as the fact "Through The Storm" was co-written by Diane Warren, the song wasn't anywhere near as big. In fact, even though she drafted in Whitney Houston, James Brown, The Four Tops and Kenny G for other songs on her album of the same name, she didn't end up with any hits from Through The Storm. Originally released in 1972 by Harold Melvin & The Blue Notes (whose lead singer at that point was actually Teddy Pendergrass), "If You Don't Know My By Now" became Simply Red's biggest global hit - a number 1 in Australia and the US, and a number 2 back home in the UK. It's also one of my least favourite singles by the group, whose '80s and early '90s output I'm not ashamed to say I quite like. But give me a track like "The Right Thing" or "A New Flame" any day over this dreary ballad. Here's another future chart-topper from the boy band created by the brains behind New Edition - although it wasn't until NKOTB went from wearing fluffy jumpers and signing saccharine love songs to a more streetwise look and edgier sound (for pop) that they truly connected with their target audience. And boy did they connect. This number 1 single was one of four top 10 hits they managed in Australia in just over a year, while in the US and UK, that tally was more than double, with nine top 10 hits in each country before the boy band's time in the sun was up. I'd been a fan of The Cure's singles throughout the '80s - it was hard not to be with an older sister who loved the band - but I could never get into "Lullaby". Obviously, it wasn't poppy enough for me, since my favourite song of theirs is "In Between Days", and everything about it creeped me out. I realise that was kind of the intention, but I could not fast forward through the video quickly enough as I watched the Rage countdown each week. Disappointingly, although "Lullaby" gave the band another top 30 hit in Australia (their seventh), none of the other singles from the Disintegration album - which included the excellent "Fascination Street", "Pictures Of You" and their biggest US hit "Lovesong" - managed to crack the Australian top 50. How on Earth was Madonna going to top "Like A Prayer"? By releasing the most expensive music video ever made, that's how. Although its budget has since been surpassed, the David Fincher-directed "Express Yourself" cost $5 million and looked it. Inspired by the 1927 film Metropolis (not that I've ever seen it), the clip also came with a new mix of the song which finally turned up on Madonna's Celebration compilation in 2009 (although a similar sounding mix was included on The Immaculate Collection). Other than its sheer extravagance and a racy scene involving a saucer of milk, there was no controversy attached to "Express Yourself" - but the song was so good it didn't need any to become another smash for the Queen of Pop. There was no stopping those Wilburys, with this solo release from Tom Petty (without The Heartbreakers) easily beating anything he'd released up until that point under his own name in Australia - although "Stop Draggin' My Heart Around", the 1981 Stevie Nicks song that'd featured Tom and The Heartbreakers, had reached number 10 here. "I Won't Back Down" may as well have been a Traveling Wilburys song anyway, since it was co-written and co-produced by Jeff Lynne, and featured George Harrison on guitar. As you can see from the YouTube grab below, Jeff and George featured in the video as well - with Ringo Starr thrown in for good measure, even if he didn't play on the actual track. The Wilburys effect didn't last, however, and although several more singles were taken from Tom's Full Moon Fever album, this was the only one to enter the ARIA top 50. Not one to rest on her laurels, Kylie wasted no time moving on to her second album, Enjoy Yourself, ahead of which this brand new single was released. It was another instant hit in the UK and, several weeks later (which was kind of annoying), here in Australia. In Britain, "Hand On Your Heart" became Kylie's third number 1, while in Australia, it was her fifth top 5 single. Below the simple but effective music video featuring those primary colour dresses is a live performance from Countdown Revolution - and Kylie's vocal, like pretty much all her TV appearances throughout her career, is indeed live. Still, it was going to take more than that to keep the Australian public onside, and they'd already started to turn in a major way. Next week: a bonanza of awesome dance tracks - none of which managed a spot in the top 50 - and some new entries that did make the singles chart by boring old rock acts. Before that, I'll conclude my countdown of my favourite songs from 2004. I don't think I'd heard/was aware of the Aretha duet at the time, though I was aware of the Whitney one (but never heard it). I liked the Proclaimers track, though I'd almost completely forgotten about it until recently getting hold of their best of DVD with the video on it. I had recorded it from Saturday Morning Live, but stupidly taped over that VHS tape a few months later, losing several rare videos in the process (a travesty I'd repeat in 1990). The video was recorded in Melbourne, and I believe this single was an Australian-only release. I was surprised when I saw The Cure's 'Lullaby' debut on the rage top 50. Triple M had been playing the US-only single 'Fascination Street' on their Top 8 at 8 just a few weeks earlier, and I assumed that that was the first single from the album. I hadn't heard 'Lullaby' before it entered the chart. Like Metallica's 'One', it was quite a scary video to sit through in the dark alone as a 10 year old. 'Express Yourself' was another one that came out of nowhere for me. I suspect it may have had a mid or late-week release given its low (for her at the time) debut position? I was surprised that 'Hand On Your Heart' didn't climb any higher than its #4 debut. I'd kind of expected it to go to #1. A bonanza of awesome dance tracks that didn't crack the top 50 next week? I'm intrigued! Seeing 'Come Anytime' as a breaker at the fifth positions reminds me - I'm pretty sure that Molly Meldrum announced it as a new entry in the chart (at number 70-something, though I forget the exact position) on this week's Humdrum segment on Hey Hey It's Saturday, which was possibly the first time I realised that there were official chart positions below #50... and also indicates that some in the industry definitely had access to the elusive full ARIA top 100 from this period (as did Countdown Revolution later on). PS this is the week that Julian Lennon's 'Now You're In Heaven' topped the AMR chart. That must surely be one of the biggest discrepancies between the AMR and ARIA charts of the time - that an AMR #1 single was only at #5 on ARIA's chart. Unless the competition in the top 5 was particularly hot, which it may well have been this week. I wonder once ARIA split from the Kent Report/AMR whether the chart weeks were the same for the two, and if it's conceivable that had ARIA used the same chart week whether Julian would have had a number 1 single on ARIA as well. i.e. were their stats and data sources that different, or was it just a case of one ending on a Saturday and one on a Monday (or whatever it was). You may well have discovered this already yourself, Gavin, but I figure it's worth mentioning here (belatedly!). Back in the early days of the ARIA Charts, their data sources were limited to capital cities and major regional centres, whereas David Kent was able to rely on his extensive network of contacts for data. There was an article published in a Sydney weekend magazine once, which stated that at the time, ARIA's NSW data pool only extended as far as the western suburbs of Sydney. David Kent was interviewed for the article and commented that the differences between the two charts were explained by "different data sources". He also mentioned that he thought that the two chart companies "kept each other honest". Gavin - here's an active link for Kylie's Countdown Revolution performance (the one in the article is broken). Really interesting info re the chart data sources, Carta - thanks! And yes, I'm constantly having to replace YouTube links! I never heard of the Aretha Franklin album or this single? 'I Knew You Were Waiting' is in my Top 5 80's tracks. 'Lullaby' freaked me out too, watching it on the rage Top 50 in the early morning in winter in the dark. I have the song on 12" on a 12" compilation CD. I remember when 'The Right Stuff' came out, everybody thought they were pretty cool, even the fellas, but soon they became the boy band and their follow up 'I'll Be Lovin' You' confirmed that they were def. for the girls. I liked Jordan's and the other guys solo work in '99. Gavin, I agree the Simply Red track 'If You Don't Know My By Now' isn't their best. I think their best was their album from '91 - 'Stars' with the first single -'Something Got Me Started' and the fantastic single 'Sunshine' from 2003, sampling Hall & Oates 'I Can't Go For That'. 'Express Yourself' was a fantastic follow up to 'Like A Prayer'. I remember rage always played the other version from an American Awards shows (or it could have been a rehearsal performance?) and that sounded and looked fantastic too. 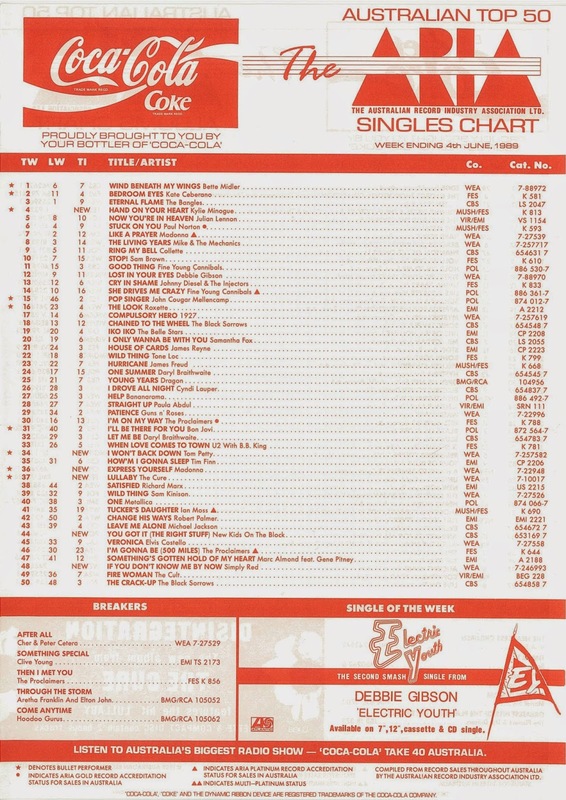 The ARIA charts were good in '92 when they had the state charts listed. There's an interesting alternative version of 'Lullaby' that surfaced a couple of years ago on a re-issue of the 'Disintegration' album; almost sung from the perspective of the 'spiderman' - well with a deeper and more menacing vocal anyway. I don't know if I can embed here, but it's on youtube: http://www.youtube.com/watch?v=quhuH48oUko . I liked 'You Got It (The Right Stuff' a lot when it was out, though I preferred the 12" version that Triple M played on the Top 8 at 8. 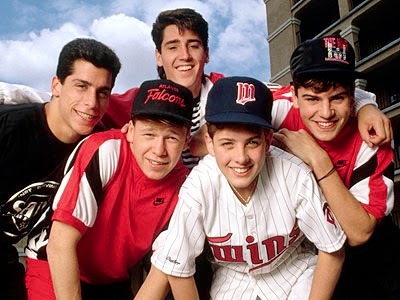 Yes, everyone seemed to love NKOTB at school at the time, though I started to go off them with the sappy follow-up. In some ways they probably limited their audience with all the songs addressed to their 'girl' fans. That reminds me, a friend I made at uni had their 'Hangin' Tough' cassette album still, 10 years later (but denied owning it). She put it on in the car and we both knew the words to 'My Favourite Girl' somehow, though I never owned the album (someone in my class brought it to school to play sometimes). I think it was a rehearsal of 'Express Yourself' that rage aired a few times during their Madonna specials, but they definitely played the video when it was in the top 50. The state top 10 were listed on the ARIA chart from 1990, I think around May. Occasionally there would be a song, e.g. in the WA top 10 that hadn't yet cracked the national top 40 (Bang the Drum's 'Passion' springs to mind), which I always found interesting. Ram Jam's Black Betty (in 1990) was another example of a song that was really popular in one state (South Australia, it might have even reached no.1 there, but that's stretching my memory) but whose national ranking (17, from my research) was a lot lower. I still have no idea why it was so popular in SA, I've tried searching to find out but this was pre-internet days and so have drawn a blank. Tina Turner's What You Get is What You See, which was mentioned on this blog a few weeks back, is an example of a song which had a recognisable reason (used in rugby league advertising in NSW and Qld) for a (almost certain) state bias in chart position in 1989, although it never quite reached heights in the charts that year. When Rage play old Countdowns every January, the Chartbusters section often featured references to songs doing particularly well in one state or another - especially in the early 80s. Often it would be down to a song getting a lot of airplay in one state or an act coming from a particular region of the country. But as radio became more nationalised, and now with the internet, regional variations weren't as common. Pleasantly surprised to see Metallica's "One" in the top 40. I'm going to be the unpopular one here and say that I liked The Proclaimers, and that 'Sunshine on Leith' was the first album that I ever got (admittedly I was only nine years old at the time and I had to lobby my mother to shell out the $16 or so to buy it on cassette). The Reid twins' accents were distinctive and distracting, but once you managed to get past them (or tune them out) you were left with some rather pleasant folk-pop (if that's the correct term) songs. That said I'm not sure if "Then I Met You" would have been the best choice for a third single, although UK single "Sunshine on Leith" would have been too slow to work in Australia (and there aren't enough Hibernian fans out here to begin with, being a popular crowd chant). "Sean" would have been a better choice: still quite upbeat (although not as fast as "Then I Met You"), but with the brogue turned down so as not to drive you bonkers. In fact it might have worked better as a second single instead of "I'm On My Way" if only to minimise the effect of the twins' accents. Given their runaway success in 1989, I imagine there are a lot of readers who were Proclaimers fans!